The first of a number of evidence gathering sessions for the Commission on Religious Education (CoRE) will be held on Thursday 23 February 2017 at Grey Coats Hospital School in Westminster. The aim of the meeting is to give people an opportunity to make their views known on Religious Education in schools and colleges for young people up to the age of nineteen. For more information about contributing to the session, please visit the Commission website. If you would like to attend the session as an observer, please let CoRE Project Manager Jon Reynolds know by emailing him at evidence@commissiononre.org.uk. The Commission is also still collecting evidence through this survey. All responses to this call to evidence will be made available in full to all Commissioners but will not be published without your permission. When directed by CoRE, the secretariat of CoRE, provided by the REC, will provide an analysis of the responses. There is no restriction on the type of evidence that can be submitted, though CoRE believes that a degree of structure in the evidence is helpful. The survey can be found at: https://www.surveymonkey.co.uk/r/CoRECallforEvidence and will be available until 9.00am on 13th February. Visit the Commission on RE website to read the latest Commission news, contribute ideas and submit evidence to the Commission, and to sign up to receive news alerts. NATRE and the REC have initiated the first nationwide project to collect information with a view to accurately reporting on how all ~4,500 state-funded secondary schools in England and Wales are making provision for religious education. Schools have been sent a formal request via email for the required information, including a link to a short but comprehensive survey to complete, and other stakeholder groups like trade unions and Governors’ bodies will be contacted to explain the need for the survey. We will be outlining to them the importance of the data being collected for the future provision of RE and the benefits good quality RE offers to our young people, our communities, and society as a whole. The results will allow REC/NATRE to create a snapshot picture of compliance across the country that will highlight examples of best practice and innovation that can be shared, as well as identify under-performing areas where additional future support can be targeted. The data will be collected online during February, then collated and critically assessed, with the findings published during the summer term. The teacher recruitment campaign is working with limited funds this year, but we are very keen to continue to get the message out to as many people as possible that RE teachers are needed in our schools! Please download this PDF with five ways that you can support teacher recruitment, and feel free to share it with others! The Teach:RE course is tailored to teachers in particular stages of their career. The TeachRE:LITE course is designed for those in Primary ITT and NQTs to help with subject knowledge and expertise.The Secondary Teach:RE Complete course can help NQTs develop schemes of learning and resources to use in the classroom, or even help them plan and evaluate a field trip to a place of worship. For more details visit: http://www.teachre.co.uk/teach-re-course/course-options/ or email kathryn@cstg.org.uk. Follow this link to access the Bahá’í RE website. If you have any queries or would like to provide feedback or suggestions for improvement, please e-mail the Bahá’í RE team at opa-re@bahai.org.uk or use the contact page on the site. Should religions evolve to take into account changing society? How does Hinduism relate to other religions? How does Hinduism handle challenges from rationality? How do we stop violence in the name of religions? RE Today’s latest CPD opportunities are now up on the website. This terms courses cover an array of RE related topics suitable for teachers of all key stages. Visit the RE today website www.retoday.org.uk/courses to find out more and book your place. Hodder Education is offering subscribers to the REC newsletter a 15% discount for all of their teacher training day courses for those who book by 28 February 2017. Simply quote the discount code WF0004422 when making your booking to reduce your course fees by 15%. Click here to view their course list. A new Agreed Syllabus for the teaching of Religious Education in schools in Hampshire, the Isle of Wight, Portsmouth and Southampton has been launched (December 2016). 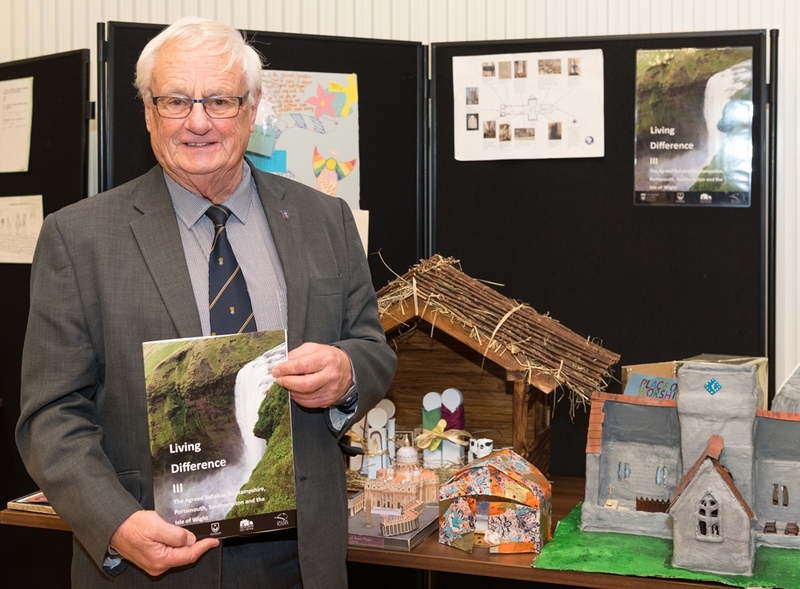 ‘Living Difference III’ builds on the approach to religious education which has been in use in this region since 2004, enriched by current educational research as well as philosophical and theological enquiry. Living Difference III will provide the basis of good teaching in religious education. It will help children and young people to explore their own perspectives on life, understand what it can mean to live with a religious orientation, as well as considering other ways of life, including the non-religious, and foster awareness of the wide variety of ways of life in our local and national communities, and around the world. This year's joint AREIAC and NASACRE will be looking at the theme 'Religions are not Monoliths', exploring the contemporary liberal wings of Christianity and Islam. This conference aims to explore the ideas of Muslims and Christians that take what might be called a ‘liberal’ view. Click here to complete a booking form to reserve your place. Over 200 Religious Education teachers and professionals from across the UK attended Strictly RE, the National Association of Teachers of RE’s national conference on the 28 January in London. Strictly RE is designed to inspire and equip teachers and professionals of RE with knowledge, techniques and resources on how to deliver excellent RE, through key note speakers, a choice of over 18 interactive and thought provoking seminars, as well as opportunities to collaborate and share best practices with peers. Key-notes on the day were delivered by Stephen Pett, National RE Today Adviser, who discussed 'Where do you stand on knowledge? Insider and outsider views on religion in RE' and Vanessa Ogden, Head teacher at Mulberry School, 'Civilisations are built in schools: the role and importance of RE in our 21st century world'.